Dee Dee is lying on her back, the cacophony of the MRI machine’s ringing and buzzing all around her head. She stares straight up at a mirror that’s tilted so she can see a computer screen at her feet. It projects a series of images: a glass of beer, a piece of pizza, a line of methamphetamine. In her hands, she holds the controls to indicate, on a scale of 1 to 4, how much she wants what’s in the picture. The more detailed the photos became, the more she wanted what was in them, she said later. A bag of white powder? No big deal. But a needle, with speed in it, ready to inject? That was different. A team of researchers at Stanford University are scanning the brains of stimulant users like Dee Dee to better understand one of the most intractable and frustrating questions in addiction treatment: Who is most likely to relapse and why? 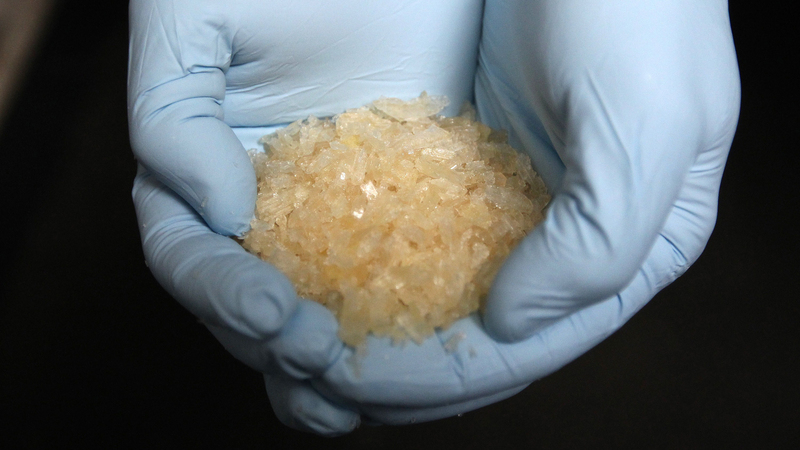 Current studies show that 60 percent of people in rehab for meth addiction relapse within a year of discharge, a stat that has health officials on edge as meth use in San Francisco is again surging. Neuropsychologist Kelly MacNiven and her team believe they may have identified a signal in the brain that can predict who will relapse. While test subjects like Dee Dee look at pictures in the MRI scanner, MacNiven sits on the other side of the wall, looking at the brain scans on her computer screen. When all the scans are complete, the teams goes over them, specifically studying the nucleus accumbens, located in the middle of the brain. In their first round of the scanning study, MacNiven’s team found that the people whose brains really light up in this spot when they’re looking at the pictures of meth and cocaine are the ones most likely to relapse. Six months after the scan, they were twice as likely to have used again. “This suggests, if this replicates, that we have a brain signal that basically is related to relapse,” says MacNiven, a postdoc fellow in the psychology department at Stanford and lead author of the study. Dee Dee was 14 when she tried methamphetamine for the first time. Her parents had recently gotten divorced. “My family, in the blink of an eye, was torn apart and I didn’t understand it,” says Dee Dee, who asked that we not reveal her last name. “I remember just being really broken." She had to move, and the kids she became friends with were experimenting with all kinds of drugs. But she liked meth the best. She used on and off for years, then went into treatment when she was 26. She met a guy there. They got sober together and had a baby. Then he relapsed. And then Dee Dee relapsed. She was using meth every day. Within four months, Dee Dee lost her job, her apartment, her car. Now she’s in treatment again, trying to understand what it was about last time that didn’t stick. “I just don’t want to be in and out of treatment centers. I want to get it right,” she says. Relapse most often results from a trigger in the user’s environment: driving past the bar they used to go to in order to get high, the smell of a certain cigarette or running into someone they used to use with. 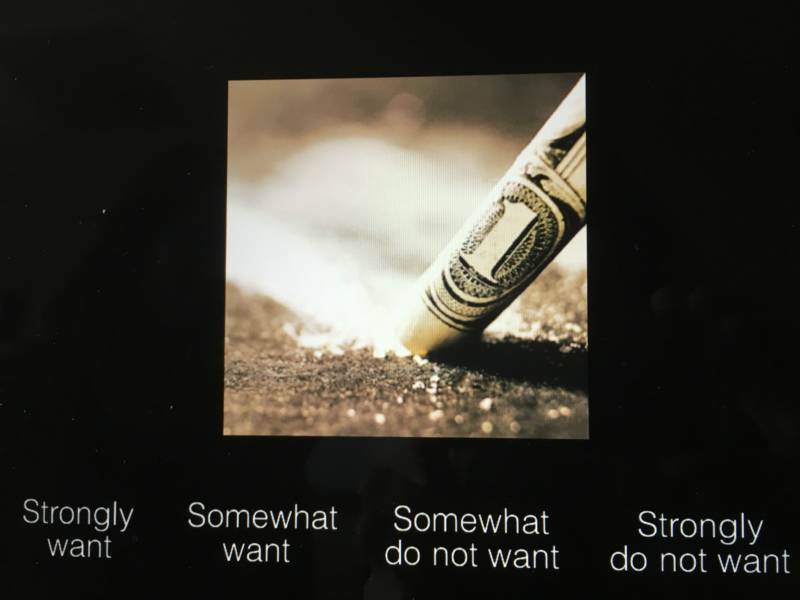 This is what researchers are trying to emulate in the MRI lab, by showing pictures of drug paraphernalia to elicit the same response in the brain. MacNiven and her team believe dopamine is at work here: Before a person has smoked or snorted any drug, the brain releases a bit of dopamine in anticipation of getting high. “Addictive drugs are in some way hijacking the dopamine system,” MacNiven says. They do this in two ways. First, there’s the dopamine response to the meth itself that makes a person feel really, really good. Second, there’s a kind of learned behavior, a trained dopamine release at the sight of the meth, or the old bar or friend — this is the brain teaching itself what behaviors lead to the ingestion of the drug that feels so good. In animal studies, this anticipatory dopamine release goes straight to the nucleus accumbens in the middle of the brain. The Stanford study is the first to replicate this in humans. They believe this brain marker is a much more robust, dependable predictor of who will relapse, as opposed to users reporting cravings or environmental triggers. The study showed that users themselves cannot predict their own likelihood of relapse. So even though Dee Dee could taste drugs in the back of her throat when thinking about pictures of dope, in the end, that may have no bearing on her risk of relapse. 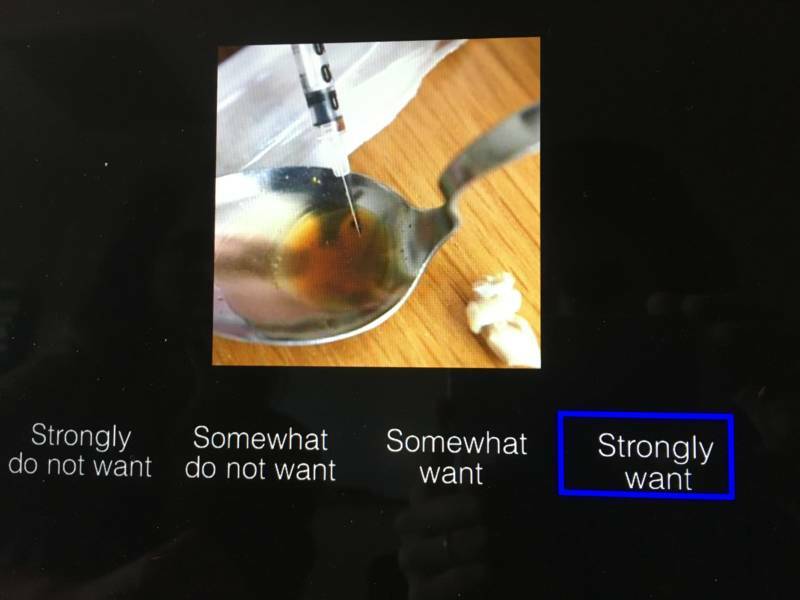 In MacNiven’s first round of tests, what former drug users said they wanted had no relation to what their brains said they wanted, MacNiven says. Self-reports did not predict who ended up relapsing and who didn’t. Only the brain activity did. “We actually think this is interesting and might be a factor related to addiction, meaning that you might not have the ability to really know what you want,” MacNiven says. To be sure of this conclusion, researchers have to test more people. They did the first round of scans on veterans — almost all men. Historically, this is true of a lot of addiction research. MacNiven is now actively recruiting and testing women to make sure her results hold up. If the findings do hold up in a larger, more diverse population, the implications could be powerful. Treatment providers could tailor care more specifically and target more precisely who should get what kind of treatment and for how long. “Identifying those at greatest risk and providing treatment that specifically targets modifiable components of that risk would undoubtedly change the landscape of substance abuse treatment, likely attracting more people who need it and perhaps reducing burnout among those who provide it,” Nierenberg writes. But it also means the only way to know who’s at highest risk for relapse requires giving everyone an MRI. But of course getting access to this kind of diagnostic care is much more complicated than that. 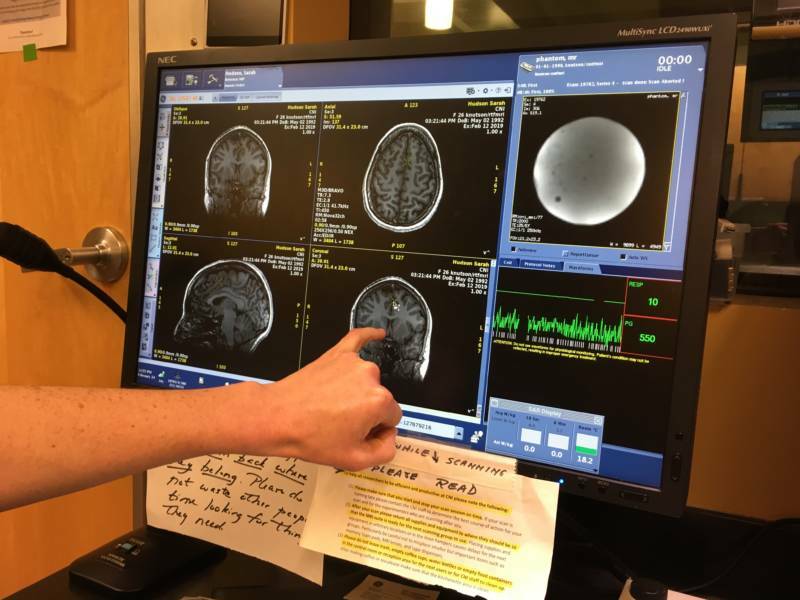 Not everyone who needs help with relapse lives near Stanford, or any MRI lab, and the details of this experiment are complex and difficult to emulate in other clinical settings. Plus, the scans take six hours for each test subject — not everyone can tolerate being enclosed in a tight, noisy machine for that long. "These results help to advance the field, although use in clinical practice is unlikely, at least for the time being," says Dr. Phillip Coffin, director of substance use research at the San Francisco Department of Public Health. Then there is the question of effective treatments. There are no Food and Drug Administration-approved medications for stimulant addiction the way there are for opioids. 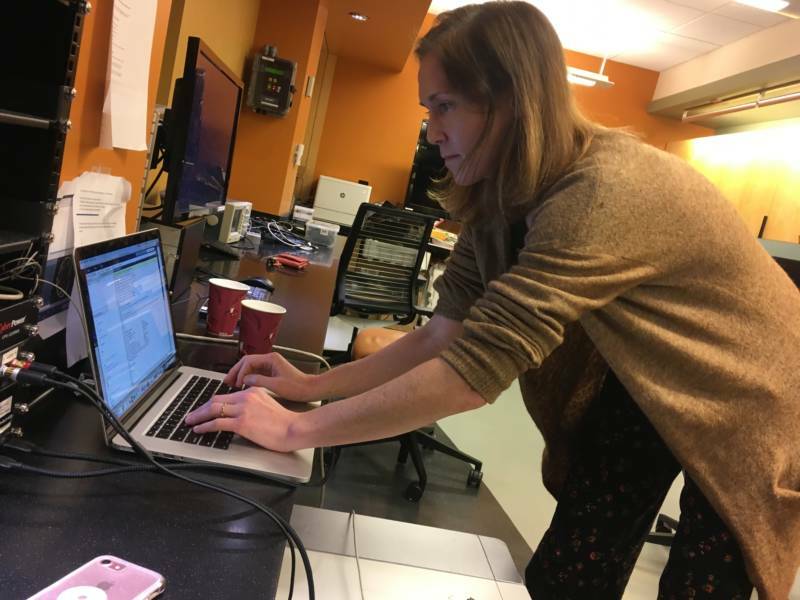 MacNiven and her team are brainstorming other options from their research — things like magnetic stimulation of the scalp to interfere with the brain’s addiction activity. Or neurofeedback, where users train their own brains not to light up at the sight of drugs. That would be a relief to folks like Dee Dee. She’s been in treatment for four months so far at the Epiphany Center, a residential program for women in San Francisco. She admits her initial interest in participating in the study was for the free lunch and the Amazon gift card. But that changed the more she understood the research goals.